Hmmm ... whether or not this is supposed to be live, I don't know. However, it does work! Ford Build and Price - 2011 Ford Fiesta! 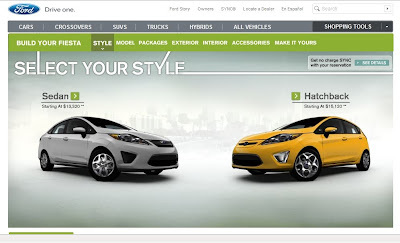 The splash screen says the Fiesta sedan starts at $13,320; the hatchback at $15,120. Sedan models come in S, SE, and SEL trim; hatchback comes in SE and SES trim levels. Steel wheels do look to be standard, with 15", 16", and 17" alloys available. I'm a little disappointed that there's no base hatchback; I'd suggest to them to offer S and SE trims in both body styles and the SES hatch, and skip the SEL sedan - anyone who wants a loaded small car will probably want a hatchback. I think the car looks pretty good in the hatch configuration. I don't like the "ash try" chrome bits on the front, but I'm not sure if they will present on the American car. When I price out the Fiesta, on the "build your own" link, it comes out a little pricey. To get what I have on my Accent SE, some things not being interchangeable, the price is $17,995. My SE cost $15,500 this year, with $1,500 cash back....so more like $14,000. The 2010 Accent SE has gone up to more like $16,500, with a few minor upgrades, and it still appears to be much cheaper than a comparable Fiesta.....especially after the cash-back. Welp, no 2-door after all. And no sunroof option. Too bad, I was excited to replace my Focus with another Ford. Hyundai Accent, here I come. I'd assume the list prices are padded for the routine-cash-back that'll start happening once pent-up demand is satisfied and supply settles into normal. Or to put it another way, "how soon do you need a new car?" I don't expect to see cash-back for the Fiesta anytime soon. Perhaps the fall of next year? I haven't heard anything about a sun-roof becoming available either. If it does, you should expect to pay $19,000 to $20,000 for a decently equipped hatchback with that feature. Even with cash back, that's still $18,000 to $18,500. It might be worth looking at a loaded Accent SE with moon-roof, and then decide. I would expect the loaded SE 3-door could be had for $16,000.....actual cash paid after rebate. I used my $1,500 rebate to pay for the optional AEM intake, DC Sports tower strut brace, brushed aluminium doors sills, carbon fiber (faux) mask, and a Borla turbo muffler. The car was amazing to start, but the rebate funded my make-it-cooler project.